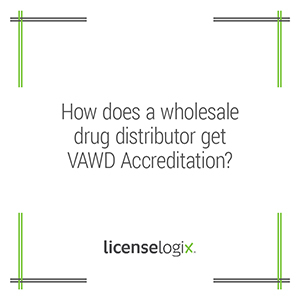 VAWD, or Verified-Accredited Wholesale Distributors, is an accreditation issued by the National Association of Boards of Pharmacy (NABP) to wholesale distributor facilities. The accreditation ensures that facilities operate legitimately in full compliance of state and federal laws. Twenty one states recognize the accreditation and North Dakota, Wyoming and Indiana require it as an element of the licensure process. The accreditation process involves verification of the distributor’s existing state and federal licenses, criminal and financial background checks, and a detailed review of the company’s policies and procedures. The application also requires a $100,000 surety bond, proof of insurance, photos of facility, list of customers and vendors, a detailed business description and an ownership chart. The policy and procedure guides required are extensive. Formal company documents must be submitted in the areas of licensing and compliance with laws/regulations, operations, security, records, and many more. These documents must lay out a detailed plan of action for achieving the highest standards of compliance. The application process takes 7-12 months. The initial fees are approximately $5,000, but they vary based on the number of background checks required. Annual renewals and documentation are required to maintain the accreditation. LicenseLogix can help wholesale distributors craft policy and procedures to meet the licensing and compliance requirements of the VAWD accreditation. Our services will help your company obtain all licenses and registrations and manage ongoing license renewals and compliance with state laws and regulations. For additional help you can fill in the form on the left or give us a call at (800) 292-0909.